I don't know who you are. I don't know what you want. If you are looking for Tai Chi I can tell you I don't have silk robes, but what I do have are a very particular set of skills. Skills I have acquired over a very long career. Skills that make me a Sifu for people like you. If you'd rather do Tae Bo, go now, that'll be the end of it. I will not look for you, I will not pursue you. But if you want authentic Tai Chi (Taijiquan), you have looked for it, you have found me, and I will teach you. Forty-five years of ongoing study in traditional and modern martial arts. Black belts in Japanese Shotokan and Okinawan Shorin Ryu Seibukan Karate. Certified instructor in Filipino Martial Arts. Proficient in dozens of weapons, both classical and modern. Founder of the FMSD system (Familiar Movement Self Defense). Listed in Who's Who in American Martial Arts, third edition, 1987. Author of Karate: Crash Course, 1991. Instructor and Instructor Trainer for Young Champions Karate, 1998-2007. 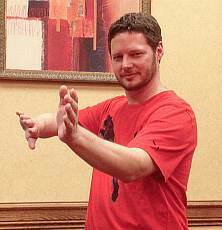 Taijiquan, Qigong, and push-hands instructor. June 2015 gold medal Tai Chi 42 form, gold medal Tai Chi broadsword, silver metal push hands. June 2014 gold medal Tai Chi 32 form, gold medal Tai Chi broadsword, gold metal push hands. June 2013 gold medal Tai Chi 32 form, gold medal Tai Chi straight sword, silver metal push hands. See also my personal website about taking private lessons and other information.